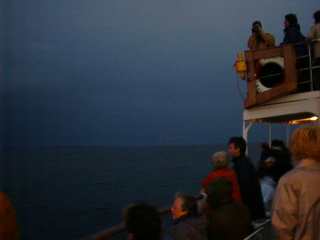 As we hurried along Ilfracombe Harbourside at 05.50 to join the Motor Vessel Balmoral, our thoughts were "would there be cloud during Totality?" and "would we be soaked by the time we got back?" The answers to these questions would be revealed in the next ten hours. The reason for these doubts was the weather forecast which predicted a cold front with rain approaching from the west. To enable the ship to reach the zone of Totality an unusually early start was required but nevertheless some 389 souls were on board at 0600 as Captain Colledge took the Balmoral out of the Harbour astern, carefully avoiding a cabin cruiser thoughtfully anchored in the fairway. 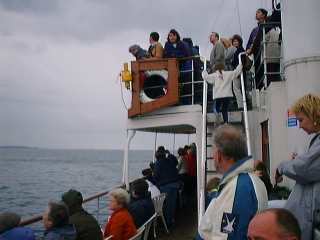 Indeed, 168 people had taken advantage of the connecting sailing from Swansea which had come across the Channel the previous evening. As this was a notable cruise, Waverley Excursions treated us to complimentary croissants and buck's fizz on departure and later in the day to a complimentary glass of wine with lunch and a complimentary whisky at tea time! We set off westward in clear weather and enjoyed fine views of the North Devon and Cornish coasts. Morte Point was passed shortly after 06.40 and we turned south west for Hartland Point. M.S. 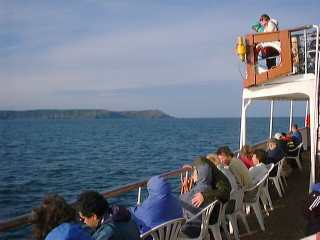 Oldenburg, the Lundy Island ferry, could be seen in the far distance on passage between Bideford and Lundy prior to making her run to Totality. There were fine views of Bideford Bay with the early morning sun twinkling on the sea. Approaching Hartland Point the lighthouse could be seen guarding the rocks. In the Ship's Shop, Tony Gamblin (re-christened for the day by Jon Holyoak as Antoine de Gambelin from Aix-en-Provence) was selling two special items - Eclipse Mugs and Solar Viewing Shields. The Balmoral Restoration & Maintenance Fund held a Grand Atlantic Ocean Raffle with ten prizes which raised £272. 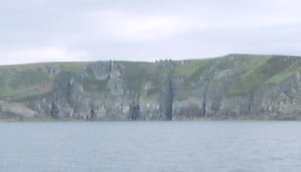 The sea was very calm and numerous fins of basking sharks were spotted. Jon Holyoak was in fine form with excessive hyperbole emanating from the ship's public address system. High on the cliffs at Cleeve we could see the array of aerials of the Ministry of Defence Satellite Tracking Station. Soon we were passing Tintagel, the northern limit of the path of Totality. About 10.00 the partial eclipse started and almost simultaneously the clear skies disappeared not to return. We got a few glimpses of the increasing eclipse through gaps in the cloud at first. Reaching the mouth of the River Camel near Padstow we were at the southern limit of our Passenger Certificate, but the cloud was unremitting and was, if anything, getting worse. M.S. 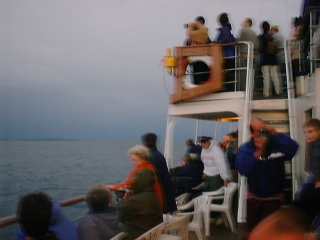 Oldenburg reported better visibility further from the coast, so we headed west towards her position. Both ships were now engaged in a search for that elusive chink in the cloud cover. Totality was due at 11.11 and as the time approached we experienced the predicted drop in temperature. The gloom gathered as if a downpour was to occur. Then a sudden drop - like a light being switched off - in the already dimmed light indicated the big moment had come. Looking ashore we saw hundreds of flash pictures being taken all along the coastline. Looking north we could see the light in the sky outside the zone of Totality. Then the deepest shadow of the moon departed eastwards at a speed of 3,000 kph and the light grew stronger once more. Then suddenly there was that chink - and we were able to see an almost complete eclipse for a few moments. In the Purser's Office commemorative Certificates, signed by Captain Colledge, were put on sale at £3, also in aid of the Balmoral Restoration & Maintenance Fund. Captain Colledge now turned the ship northwards with a promise to take us back to Ilfracombe via the mystic isle of Lundy. We were already a considerable distance from the coast so the diversion would not cause too much extra steaming We stayed parallel to the Cornish and Devon coast until we were level with Cleeve and then we changed course to port directly towards Lundy's south coast. 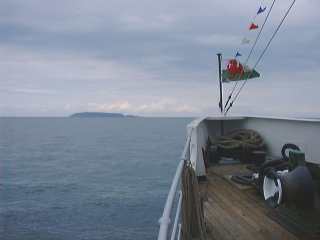 Approaching from the south provided an unusual view of the Isle. 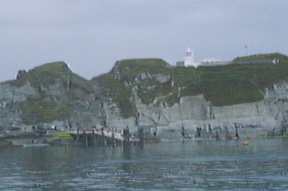 Both the present South Light and the disused Old Light, now a holiday home, stood out prominently. We sailed north up the west coast, like the dark side of the moon, not normally seen. Half way along the west coast is Jenny's Cove, the emergency landing beach. The North Light soon came into sight. 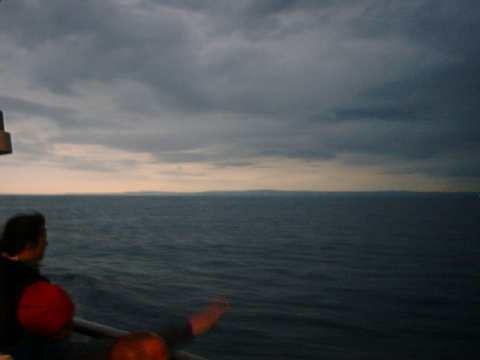 Once we were clear of the Hen & Chicken Rocks, we turned to starboard to sail down the east coast. 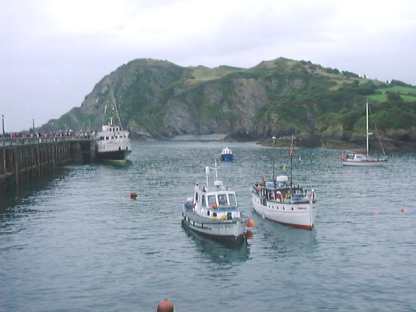 Finally, we turned to port for Ilfracombe just off the Landing Beach. The new pier looked almost ready to be used. Away in the distance the Gower Coast could plainly be seen. 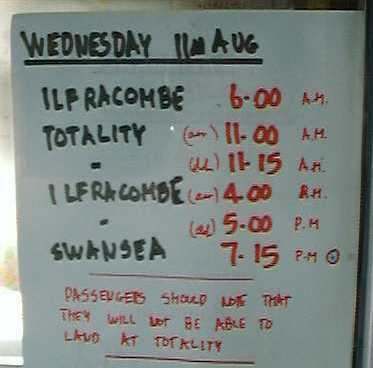 Arrival at Ilfracombe was at 1610 giving Swansea passengers an hour to stretch their legs before the final leg to the Welsh port departed at 17.15. Did we get soaked? No, we didn't - and we had been treated to an excellent coastal cruise with excellent visibility, unfortunately only at sea level!